veterans parade, a photo by jayfherron on Flickr. I am inspired by a conversation I had this weekend with a fellow MST veteran. He said things to me that helped me tremendously,he told me things I had not considered fully. 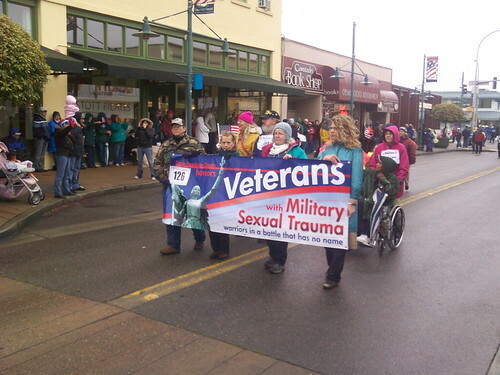 I did not realize how many I have reached,not for me,but to find a hope for a change in how Military Sexual Trauma (MST) veterans are received,and treated,when they are returned to civilian life! I expressed to my friend that my blog had taken a dip from my own interest because I have no more connection with the Veterans Administration Hospital and therefore have no ground to raise issue . I’m not a real brite guy! There are still issues! Serious issues! I am very proud of this veteran,the man who inspired me. His conversation lifted me back on the track I was trying to leave! Why I am proud for him is because independently this veteran appealed to the VA for disability due to ‘post traumatic stress disorder’ related to injury directly related to MST….and he was awarded 100% disability. There is some justice,in fact! But then in this case the VA holds re-evaluation rights every so many years. There are still issues! This veteran and I both agreed that this was an insult. We both agreed the damages to our souls were too deep to ever heal, and PTSD is forever. Of course the veteran can appeal and hopefully will. But why? Why should this ever be? We were the victims! This veteran was a victim to a crime where the only convictions were always on him, never was anyone convicted for the crime,never was the crime taken seriously, and as typical the blame was placed in the veterans direction…and it stands there! In the veterans possession is a paper saying “after some 40 years of your suffering steadily and full-time we finally agree you have been 100% injured,but might improve in a few years”!! What an insult to think that could ever be so. While a criminal walked free the victim has to continue to defend themselves? It is hard to comprehend how we can say there is justice in these decisions as many of them have come years too late. And that perhaps all will change in a few years. I wish I could encourage somebody to hope for that, but I can’t. I spoke to a lady from a non-profit group that is gearing up to expose more of the facts of MST. She gave me praise for my courage. I have no courage-it is more anger…but, I don’t believe it about the courage. You see, even if the VA approves a claim for disability in your favor it does not mean you are finally free of the past that disables you! I am in a life long battle to remain sober,and yet my knees still have scrape marks from the times I fall down. And,I fall down. And then reality glints a ray in my heart and I try to pick back up again. And I do…for a season,maybe two! But I fall. I have been determined 100% disabled due to PTSD related directly to MST. Still…everyday,even this days beginning I remember the events that led to my rapes as if they took place yesterday. Why the reel must play over and over and over is something I can not answer. I don’t want to be drunk. I don’t want to be drugged. But I do indulge in these manners of escape…thankfully now not as frequent as once was, but then there comes a trigger of some kind that causes me to seek escape. It is an insult to any survivor to assume things have gotten better! On the last day of 1969 I was told by the officer who saw my injury from being beaten up while being raped to “get used to it”. He did not offer any help, he merely chuckled at the fact of my demise, and expected me to just live with it. I have never been able to live with it. So much was taken from us. We intended to serve our country, to defend the Constitution of the United States and our Flag. It was a ‘boy-hood’ must in my era! We grew up playing Army games with great pretend wars. We were enlisting to share the freedom of democracy to lands that had none. Freedom! And rights! It add’s to the power of the damage to us because we were there to be defenders, instead we are sore with shame. It is nearly impossible to speak of my military time without feeling the shame. Many of my friends served in combat, real combat unlike anything we could imagine as kids at play. One of my friends disabled from stepping on a land mine. It is hard explaining our military time with veterans like that. No. It won’t go away, and it won’t get better. But despite it all…here is an MST veteran who lost a career and went through the mishaps of life because of PTSD’s help, who after many years of suffering has taken on the VA on his own, and was successful in at least the recognition of MST being a valid connection to PTSD. All MST veterans should applaud the courage that took! And…should take the same issue in their own lives, because this veterans achievement is powerful.